In Portland, streaks of sunshine almost always mean summer is upon us; and that it is. 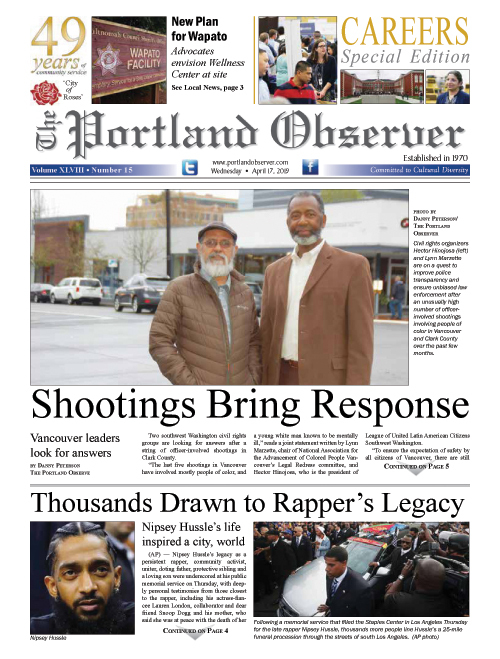 But as local youth enter summer break, the Portland Observer wanted to check on some of the things being done to keep them engaged. In Portland Public Schools alone, more than 48,000 students were served this year. Though the majority of those kids will not be engaged with their school during the 3 months of summer vacation, many children will come into contact with a school program or special activity in one form or another. Programs like one at Roosevelt High School which helps incoming 8th graders prepare for high school and college are one such example. Public charter school Self Enhancement, Inc. is another local summer resource with its programs known for fostering academic excellence amongst its primarily underserved minority student population. At SEI, both of its middle and high school students must take at least one class, five days a week, during the summer. Anthony Deloney and Tony Hopson Jr. who both designed the school’s summer programming say this type of engagement is not only a preventative step to keep kids out of trouble, but also one that will keep the pupils focused on education during the summer days as well. They point to a recent study conducted by statisticbrain.com which found learning loss over the summer is responsible for two-thirds of the high school freshman achievement gap. That same study also reported that 60 percent of black dropouts end up spending some amount of time in prison. SEI estimates that 1,005 students will be participating in their summer activities. A city of Portland Gang Task Force meeting held Friday at the North Police Precinct in northeast Portland focused on some of the issues concerning youth violence rising as the temperatures rise. At the gathering, which brought in a host of community members, Portland Police announced the month of May had seen 16 gang-related shootings, the same amount it had been last year. Ciyanna Webb who works for Youth Violence Prevention said keeping violence down is primarily about offering opportunities to young people entrenched in a particular lifestyle where productive opportunities may not seem readily available. For the 18th year, Portland Police will conduct ‘Operation Safe Summer’ with special programs to help kids find new hobbies, play sports, and stay engaged in positive activities during the summer break. Several community members at the meeting announced upcoming opportunities for young people, including a free basketball league for young people, ages 8-25 at the Salvation Army on North Williams Avenue and Moore Street, and a mentorship program running right along one of the police “hotspots” at 162nd Avenue and Stark Street that matches young men with job opportunities. Another event announced was an all-day hip hop concert to be held at Pioneer Square dedicated for homeless youth entitled “Stories from the Streets". Hosted by New Avenues for Youth, the affair includes headliners like Blacque Butterfly, Tope, Mic Crenshaw, Talilo, Bad Habitat, with various homeless youth who will also get a chance to perform their original music. Dr. Alicia Moreland Capuia, the Portland physician the Portland Observer featured in December with her trauma-informed program focusing on young men of color wounded in gang activity, says keeping kids safe is primarily about giving them an avenue to engage. “If kids have a sense of purpose, something to do, something fun to do, we’re more likely to stay out of trouble,” she said. Community staples like the Blazers Boys and Girls Club, McCoy Academy, and Portland Community Media are still accepting enrollment applications for summer vacation students, while Portland Parks and Recreation offer many free programs for all ages throughout the summer.